ABSOLUT 24TH. This new Christmas 2000 ad shows a woman walking down a snow-covered sidewalk, past holiday-decorated store windows. Snow flurries fill the night sky. It's Christmas Eve and the woman has completed her last minute shopping; her arms are piled high with wrapped gifts. 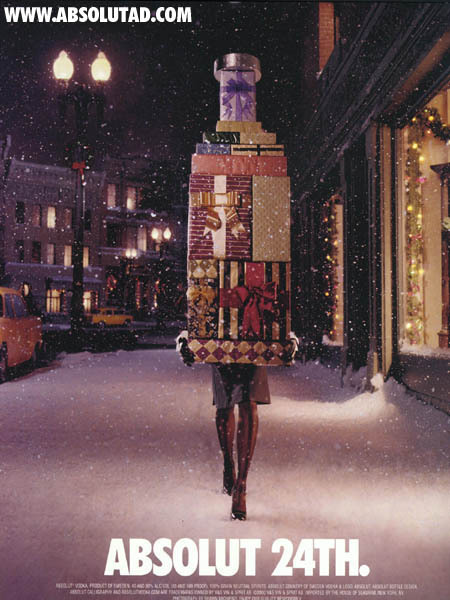 Only the woman's shapely legs are visible; the stack of gifts are shaped like an Absolut bottle. Way on top of the gift boxes is a round hat box, giving the appearance of the bottle cap! The ad is photographed by Shawn Michienzi and I believe that this is his first Absolut ad. It's a worthy addition to a long list of holiday ads.